In the fall of 2007, I rather impulsively bought two beach side properties in the small coastal fishing village of Olón, Ecuador, along the Ruta del Sol (Spondylus). I moved there permanently in 2010 for six years, and kept a journal during that time. What follows are excerpts from it. I hope you will be entertained, enlightened, and enjoy these posts as much as I appreciated this journey. And maybe, just maybe, you will fall a little bit in love with Ecuador too. My sojourn in Germany is coming to an end. In some ways, the time with my kids has gone all too quick – on the other hand, it seems like I’ve been away from my home in Olón, Ecuador for a long time, and I am looking forward to being with friends again, and sleeping in my own bed. Since I last wrote, my daughter Kacie, my granddaughters, and I have had a few adventures. Over the fourth of July weekend, we went to Garmisch-Partenkirchen (probably better known as just “Garmisch”, much to the consternation of Partenkirchen residents. They are adjoining towns with quite a history and rivalry). Garmisch is in southern Germany, in Bavarian Alp country. Nearby is Germany's highest mountain, Zugspitze, and we had a beautiful view of it from our hotel. During our mini-vacation in Garmisch, we took a couple of day trips. On our first day, we decided to go the nearby Neuschwanstein Castle (the iconic “fairy tale” castle – probably Germany’s most photographed tourist attraction – and Walt Disney’s inspiration for Disneyland’s Cinderella Castle). It is also where the Nazi’s stored some of the purloined artwork and other treasures during World War II (there is a scene or two in the current movie “Monuments Men” that references this hiding place). According to Wiki, “the SS considered blowing up the palace to prevent the building itself and the artwork it contained from falling to the enemy”. Fortunately, they didn’t. We had only 6-month Chloe with us; Kacie carries her in a chest snuggler, and she’s an easy-going traveler. (We left Clara with a babysitter at the hotel, which had a lot of fun activities for kids her age). While one can take either a bus or a horse carriage ride up to Neuschwanstein, we chose to take the half hour walk (uphill) to it. I wore my Nike “memory shoes” that I bought while here; they are generally comfortable, but on that day, I thought the only thing they remembered is where my blisters were located. Behind us is Hohenschwangau Castle. Constructed in the 12th century. The castle has 300 steps, and doesn't accommodate strollers. It made me grateful for the conditioning I’d previously been getting, regularly climbing the 38 stairs to Kacie’s third floor apartment. It was built by King Ludwig II of Bavaria, with construction beginning in 1869. King Ludwig II apparently was a somewhat of a peculiar guy, who died under mysterious circumstances (to this day still not explained) before the castle was completed, and still has been left unfinished, which is something I was not aware of before we took the tour. After our tour, we made the 15 minute hike over to the “Marie Bridge” (The Marienbrücke, overlooking the Pollat gorge). From there are the best photo opportunities of the palace. View of Marienbrücke from castle side. The next day, we went to Munich. For some reason, I've always pictured Munich to be a dreary, gray, dull place (I don’t know why) – but it was anything but that. We drove by the fairgrounds where the world-famous Oktoberfest is held every year, and then walked the old town and Marienplatz area with a tour guide to see the Glockenspiel clock that puts on an entertaining 10-15 minute show with revolving animated characters jousting and dancing, and walked through the Frauenkirche (a church, that is known for the “Devil’s Footprint” just inside the entrance). Our tour ended at the Hofbräuhaus beer hall and I had - by far and away - the best beer I've been able to sample since I've been in Germany. Afterwards we had some free time to stroll the city on our own, and we had a lovely lunch at the farmer’s market, where there were numerous restaurants, food booths, and fresh produce vendors. Neuschwanstein Castle definitely is a "bucket-list" thing to do...but to tell the truth, I thought our day-trip to Munich was more fun. 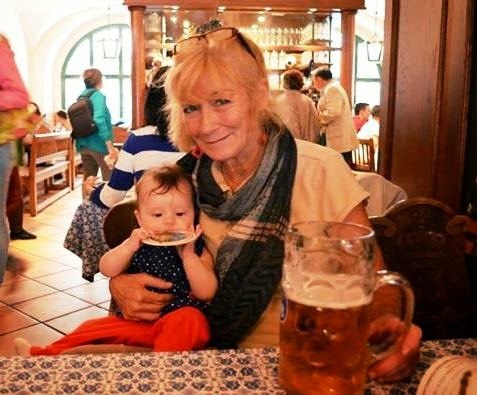 Gammy Leigh enjoying a truly great beer. Little Chloe digging the cardboard coaster. On our last day in Garmisch, we drove to a post-card picturesque lake (Lake Eibsee) for a little hike with the kids. Well, at any rate, the kids went….Gammy Leigh was pretty tired by that point, and enjoyed the view from a lakeside café while they went exploring. to him to grab him by the fur. Sunny is a very patient cat. When I first got here, little Chloe was not yet able to sit up. Now she is not only sitting, but on the verge of crawling as well. She is so good natured, just adorable – a little “Gerber” baby for sure, and it’s been fun to watch her take these small first strides. knows that a lady always wears her gloves. During my time in Germany, there was also local German/American “Freundschaftfest" (Friendship) Fest. It was week-long festival/fair/carnival that had a bunch of great food booths, and fun rides for kids and grownups alike. The fair really gave me a lump in my throat. I got to be here for Clara's first cotton candy, her first Ferris wheel, her first "train ride", her first "wheeeee big slide".... because she may now be old enough to remember a few of these moments. I know I will never forget them.